What are the top landmarks in Hangzhou? Shimmering waters, misty mountains and large pagodas characterize this area of outstanding natural beauty that has inspired many poets and artists. Visit this serene spot to photograph the reflection of Hangzhou’s most famous bridge and walk to an island with museums, nature trails and restaurants. This ancient temple is one of the largest and most extravagant temples in China, with soaring ceilings and hundreds of statues. Stroll through this inner-city green space, which is covered with native plants, such as plum trees, and has decorative pavilions, kiosks and a lake. Step back in time and learn more about local history with a stop at Leifeng Pagoda in Hangzhou. While you're in the area, stroll along the lakeside. Xihu is a neighbourhood that welcomes all visitors. Many visitors come to enjoy the natural beauty of the lakeside setting. Anji is a welcoming neighbourhood. Xiaoshan is a welcoming neighbourhood. The neighbourhood’s charm comes through in its friendly people. Moganshan is a neighbourhood that welcomes all visitors. The neighbourhood has many charming qualities, with its small-town feel among the more noteworthy. Binjiang is a welcoming neighbourhood. 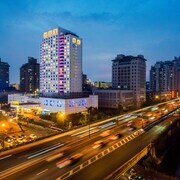 Downtown Hangzhou is a neighbourhood that welcomes all visitors. 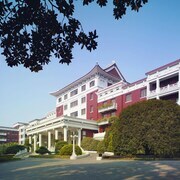 Located in Xihu, this luxury hotel is within a 10-minute walk of Quyuan Park and West Lake. Broken Bridge is 1.6 mi (2.6 km) away. 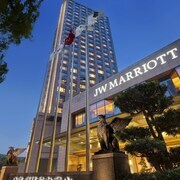 Very convenient for business and extended staying travelers. I liked the view and ambience of my room. If I really have to pick something that made my stay not as pleasant, it would be the limited choice of movie channels. 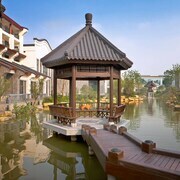 Explore Hangzhou with Expedia's Travel Guides to find the best flights, cars, holiday packages and more!